Elbow tendonitis is often 1 of 2 conditions; Tennis Elbow (lateral epicondylitis) or Golfer’s Elbow (medial epicondylitis). These injuries are similar but just apply to different muscles, tendons and sides of the elbow. Both conditions can be very painful and greatly limit movement and performance in any arm movements. The onset of pain is usually gradual but any tendonitis condition can be very persistent and won’t resolve itself without rest and support from a brace. A good elbow brace designed to support the elbow joint and tendons is a great options to help decrease that pain and get back to activity. Joints mainly consist of bones, muscles, tendons, and ligaments. Ligaments are the connective tissue that goes from bone to bone to help keep the joint secure and moving through the correct motions. Tendons are also connective tissue but they connect muscles to bones. Every major muscle is connected to bones on both ends through a tendon, and a lot of the time many small muscles can come together to attach to the bone through one tendon. For example, if you are to stand with your palms facing forward, all the muscles that run down the front of your forearm attach through a tendon to the inner side of the elbow joint at the medial epicondyle. Muscles that run down the back of your forearm do the opposite and connect to the outer/lateral epicondyle of the elbow joint. In general tendonitis is caused when the tendons become inflamed from overuse or trauma. When the tendons of the elbow experience overuse or trauma there is degeneration of those tendon's attachment, weakening the anchor site for muscles and placing greater stress on the area. Recent studies have shown that when the muscles that leads to a tendon are weakening due to overuse, micro tears begin to form in the muscle and tendon which lead to inflammation and pain in that area. Trauma like a direct blow to the tendon will cause the tendon to swell and this can also lead to the inflammation and pain. Tennis Elbow can develop with repeated activities that involve lifting, gripping/grasping, and squeezing. Obviously, it is common in tennis players but it is not limited to just these athletes. Anyone who does activities or works that requires repetitive arm, elbow, and wrist movements can develop this condition. Golfers Elbow is also caused by activities that require a strong hand grip; the contributing factor for Golfers Elbow is that there is some sort of follow through. For example, overextension of the trailing arm in golf, follow through after pitching, and the pull-through strokes of swimming. Braces for these two conditions work in the same way but just apply pressure to different sides of the joint. There are two ways that a brace can help with tendonitis, by providing warmth and by absorbing forces. A brace that provides warmth will then also help increase the circulation in the joint. Increased circulation leads to decreased soreness and quicker recovery. A brace can also absorb any damaging forces that are affecting the tendons. By applying pressure on the muscle and tendons through a strap, the brace takes any excess forces that are transmitting down the arm, preventing it from damaging the tendon. An elbow strap is the type of brace that is applying pressure to the muscles to decrease the damaging forces on the tendons. The strap has a pad and just wraps around your forearm below the elbow joint. These types of braces are easy to fit and the most comfortable option. An elbow sleeve often is a combination of a sleeve and a strap. So these types of braces provide warmth and compression to absorb forces. 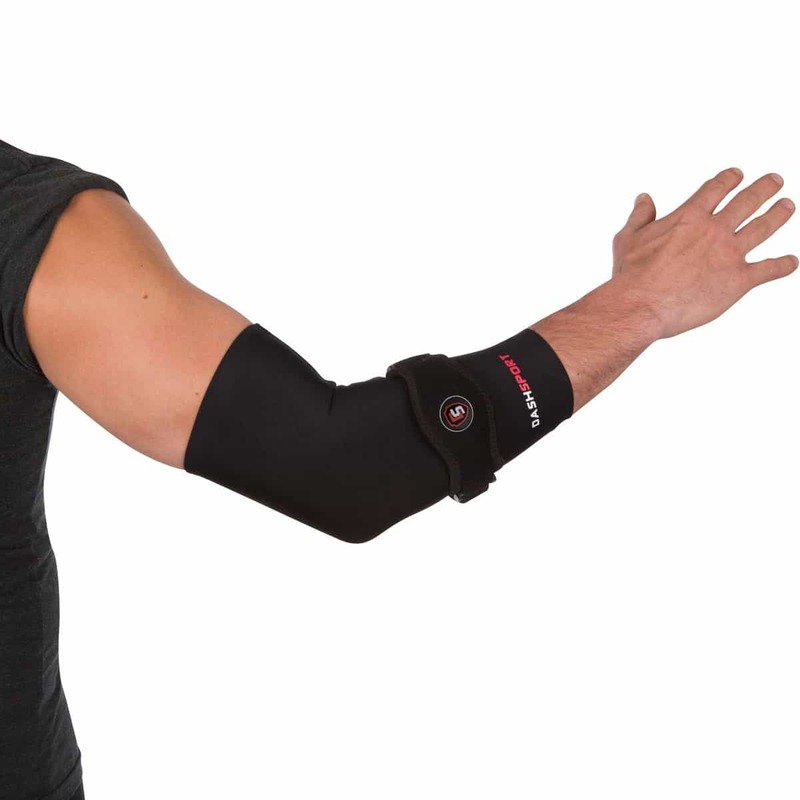 A very popular brace right now is the simian elbow brace which is classified as a strap. This option comes with two braces, a sweatband, and a bonus video on how to use the elbow brace. It fits almost anyone, both men and women because of the easy to adjust strap. The pad of this brace is a gel pad which provides great support and compression to the soft tissue of the elbow joint. With over 1300 reviews this is definitely one of the most popular forearm straps on the market. It fits tight in order to maintain pressure but does not cut off circulation. By providing a moderate amount of support without affecting your movements or performance this brace is a great option. Dashsport combines a sleeve with a strap for both warmth and compression. The sleeve aspect will provide warmth to decrease soreness and recovery joint. The sleeve and strap will both provide compression to help stabilize an unstable joint as well as the straps compression to absorb forces. You can wear the sleeve and strap separately or together. This sleeve is made with a high percentage of 88% copper nylon. Copper nylon is in amazing fabric that helps accelerate recovery by stimulating oxygen delivery and promotes blood circulation. If you are looking to reduce elbow pain and recovery time this is a great inexpensive and comfortable brace.